Next year marks the 50th anniversary of an engine that revolutionized not only drag racing, but the entire automotive industry as well: The legendary 392 HEMI. Mention the word "HEMI" to an automotive enthusiast and little else needs to be said. Or, perhaps a lot more needs to be said depending on your perspective. "The 392 HEMI is a legend so rich in automotive tradition that hundreds, if not thousands, of books and accounts have been written about its historical significance," said Chris Cortez, senior vice president -- Global Service & Parts, Chrysler Group. The original 392 HEMI engine was introduced in the new 1957 model year Chryslers and Imperials. It replaced the 354 cubic-inch version of the original HEMI launched in 1951. Compared with the 354, the 392 was completely revised and improved, with larger valves and ports, a beefier block and crankshaft, and improved bearings. In short, the 392 HEMI, often referred to simply as the "92," was perfect for drag racing. More than a few racers bolted on six or eight carburetors, slipped in a hotter cam, tipped some nitro into the tank and went racing. Racing legend Don Garlits ran a 392 in his Swamp Rat I at record speeds of over 180 mph on nitro with no supercharger. Garlits also used a 392 HEMI to officially break the 200-mph barrier when his Swamp Rat went 201.34 mph at Atco, N.J. in 1964. "There was really only one vehicle choice to showcase our new crate motor -- the bold, powerful and capable, Dodge Challenger," said Cortez. 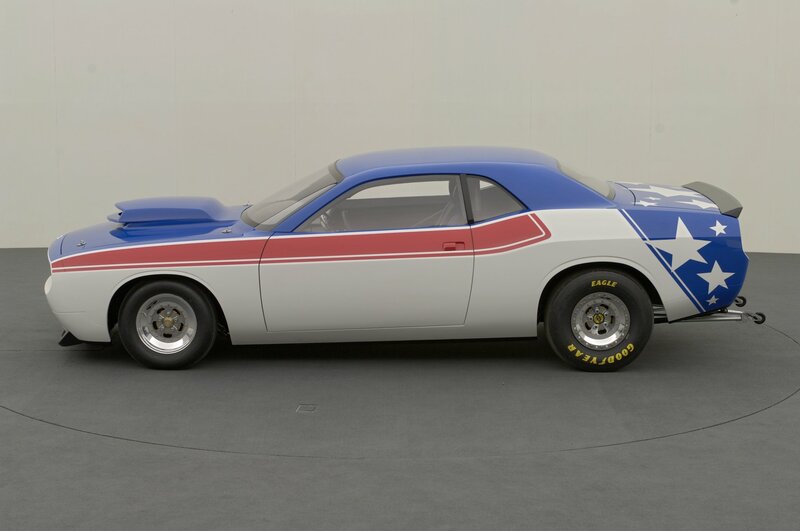 One of the most iconic muscle cars of the 1970s, it debuted in the fall of 1969 as a 1970 model. 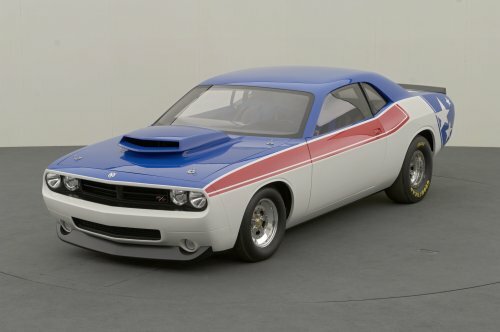 Although it was only produced from 1970 to 1974 (188,600 sold), the Dodge Challenger earned a reputation as one of the most desirable of the original "pony cars," with meticulously restored and rare examples today selling for six-figure prices. 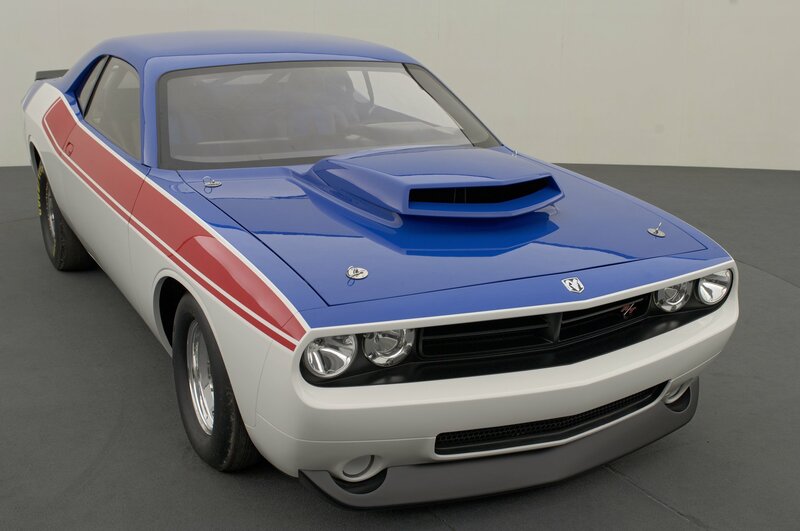 The Challenger went racing in its first year and HEMI-powered Challengers tore up the drag strips across the country in the SCCA Trans-am series and NHRA Pro Stock classes. In 1971, a Dodge Challenger paced the Indianapolis 500. "The HEMI legacy lives on," said Cortez. 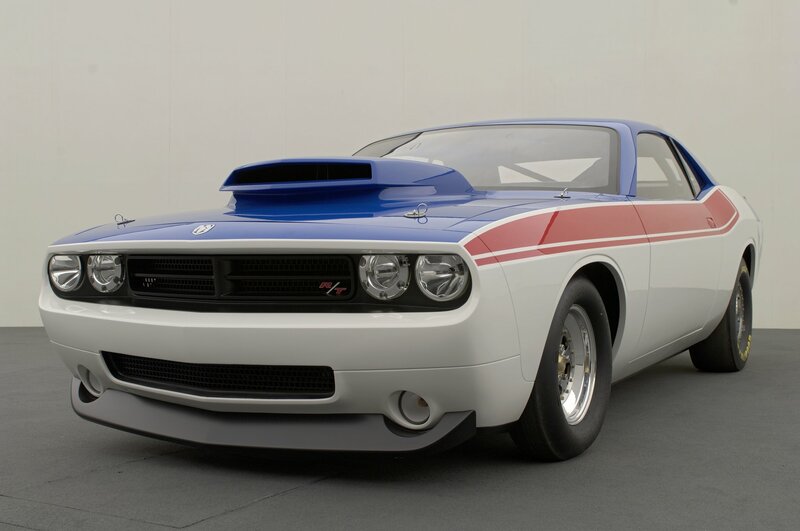 "But this Dodge Challenger Super Stock concept will no doubt bring that legacy to a whole new generation." The all-new Dodge Challenger will debut as a 2008 model in calendar-year 2008. Also at SEMA this year, Mopar is taking the wraps off the Foose HEMISFEAR, powered by -- what else -- a 392 HEMI. Foose -- visionary customizer, television personality, and hot rod shop owner -- purchased 50 392 HEMI crate motors to install in his new kit car project. "HEMISFEAR is an appropriate name, because it's destined to put fear in the ears of racers," said Cortez. "When Chip saw that Mopar's new 525-horsepower 392 HEMI featured programmable fuel injection and coil-on-plug technology, he knew he found the power to breathe life into his design and bring classic HEMI engineering to a new generation." The Foose HEMISFEAR is a rear-engine vehicle that will be hand-built and sold as unfinished Hot Rod kits by Gaffoflio Family Metalcrafters, a longtime Chrysler Group design partner and Mopar supplier. To help celebrate the 50th anniversary of the legendary engine, Mopar is launching an all-new 392 HEMI crate motor for a new generation of performance enthusiasts. This engine -- built with all new components -- is a complete engine assembly from the throttle body to the oil pan, and cranks out 525 horsepower in it most potent form. When Chrysler bought Dodge in 1928, the need for a dedicated parts supplier led to the formation of the Chrysler Motor Parts Division. In 1937, Mopar (a simple contraction of the words MOtor and PARts) was created for the business of distributing parts through a depot system and car divisional wholesalers. Mopar made its mark in the 1960s -- the muscle car era. Beginning in 1962, Mopar carried a line of "Special Parts" for super stock drag racers and developed its racing parts division called Mopar Performance Parts to enhance speed and handling for both road and racing use. Today, Chrysler Group's Global Service & Parts division is responsible for the manufacturing and distribution of nearly 250,000 authentic Mopar replacement parts, components and accessories for Chrysler, Jeep and Dodge vehicles sold around the world. To assure quality, reliability and durability, all Mopar parts and accessories are designed in strict adherence to DaimlerChrysler engineering standards. For additional information on Mopar, log on to www.mopar.com or www.moparspeed.com.